FastCarDecals.com is the number one website for CHARGIN high quality 2006 2007 2008 2009 2010 Dodge Charger Decals at the lowest prices. 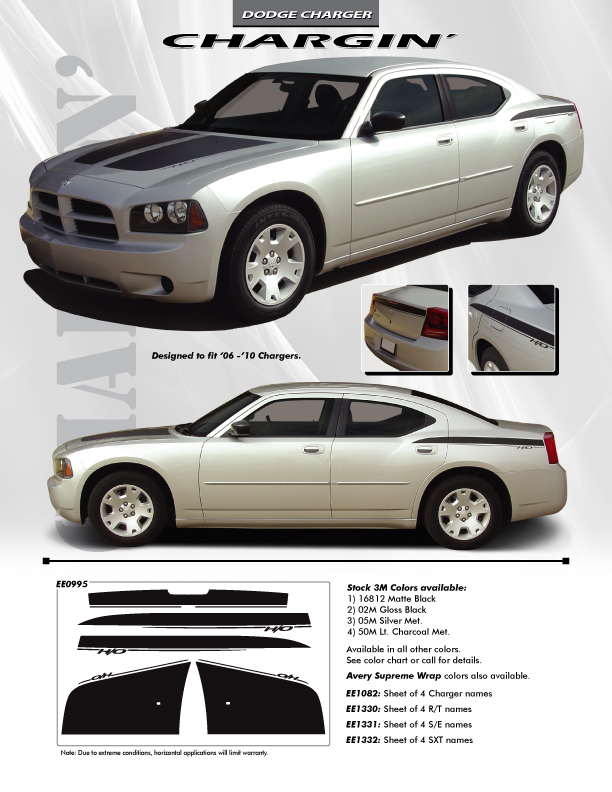 We have been supplying car owners with the best 2006 Dodge Charger Stripes since 1988 and auto enthusiasts all around the country trust Fast Car Decals to produce the best 2006 Dodge Charger RT Decals for their muscle cars. If you want the factory OEM racing style look for your Dodge Charger, then FastCarDecals.com has you covered with Dodge Charger Stripes and Dodge Charger Vinyl Graphics. These Stripe Kits are the fastest, the easiest, and the least expensive way to upgrade your Muscle car. Place your order today for your Dodge Charger Decals and, before you know it, you will be cruising around in the coolest looking Dodge Charger custom graphics in town. FastCarDecals.com TEXT or Call Us Today! Hood and Both Left and Right Side Stripe Graphics.